Due to the weather, NMA will be closed Thursday, April 11th. We are having our student led conferences this Wednesday and Thursday, March 6-7th from 3pm to 7pm. Dinner will be served and the DINO-MITE Book fair will be happening at the same time. Due to a gas leak, we will not have school today. We are currently coordinating with buses and families on getting scholars home safely. Due to the weather, there will be no school for scholars on February 20th. Due to Wednesday's weather forecast, we are rescheduling our Parent Meeting Night to Wednesday, February 27th. NO SCHOOL - Friday, Feb. 15th & Monday, Feb. 18th. 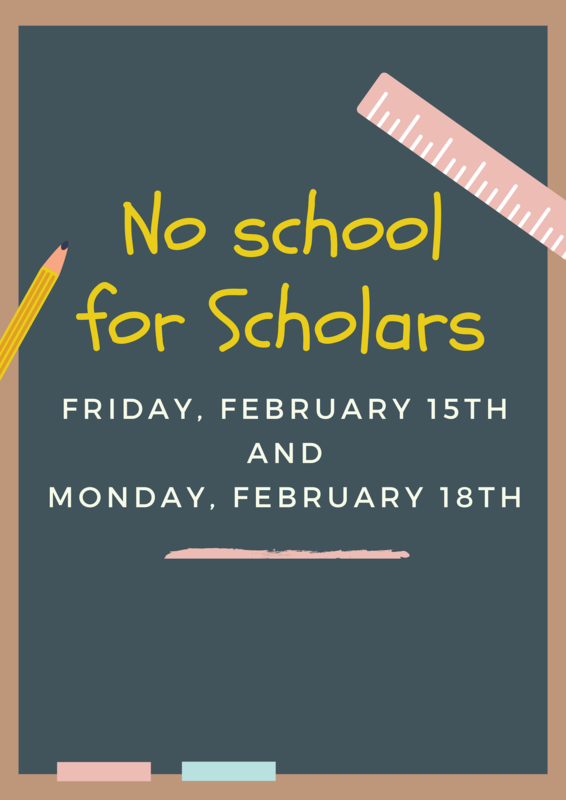 With professional development day for staff on Friday and Presidents day on Monday, there will be no school for scholars. Have a great 4 day weekend NMA and see you all bright and early on Tuesday!